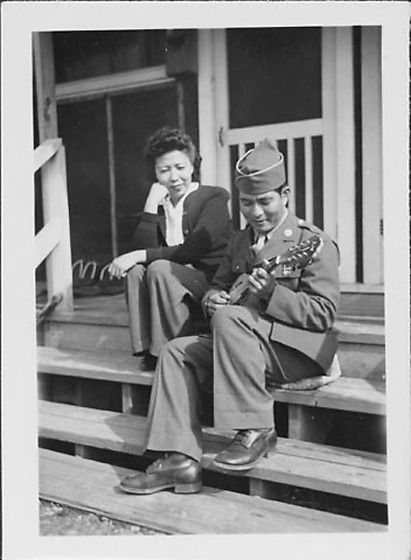 Woman sits on barracks steps next to man in United States Army dress uniform playing a ukulele at Rohwer concentratin camp, Rohwer, Arkansas, February 11, 1945. Woman sits on top step with proper right hand under her chin as she watches soldier play. Dressed in jacket over light colored shirt and necktie, slacks and garrison hat, soldier sits on a cushion on the third step, looking down at eight-string instrument as he plucks strings. White porch door in background. Stamped in black ink on back: FEB 11 1945. Written in pencil on back: [circled] D.